One of the judges on The Next Food Network Star recently offered a good piece of advice. In coaching the competitors in how to describe food when on camera, he said (I paraphrase), "Dont use the words delicious or flavorful. They mean nothing -- you have to be much more specific." This is a problem not unfamiliar to audio reviewers. In almost every review, I have to edit myself to eliminate generic, one-size-fits-all comments about audio equipment that, with minor variations on the theme, could generally be described as "pretty good stuff." Its those minor variations, though, that make all the difference in being able to meaningfully distinguish one component from the next. However, the loudspeakers currently sitting in my listening room, the Canton Vento Reference 5 DC, are giving me some difficulty. There is no lack of things to say about how they look and what they sound like. But listening to their performance, I dont feel much like writing -- I just want to listen. Their sound is, quite simply, delicious. Canton is a German company that began back in 1972 by making speaker cabinets. Its website currently lists 13 different series of loudspeakers comprising (if my count is correct) a total of 96 individual models that encompass everything anyone with ears might need, from high-end stereo to home theater to car audio -- plus 14 different speaker stands, for Petes sake. Not to mention offices in 43 countries around the world. But while the sheer number of products offered, and the companys international reach, indicate the depth of Cantons resources and marketing savvy, its also clear that Canton is committed to making high-end audio products. 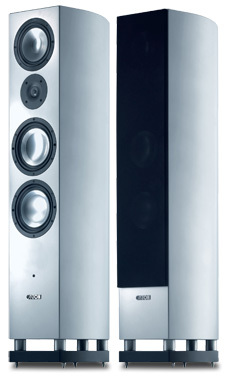 The Vento Reference 5 DC ($10,000 USD per pair) is a three-way floorstanding speaker one model below the top of the Vento Reference line, the 1 DC ($30,000/pair). The 5 DC is undeniably attractive, with curved sides, silver-faced midrange and bass drivers, and, on the review samples, a beautiful finish of cherry veneer. The finish is as good as that of any loudspeaker Ive seen, but the 5 DCs beauty is more than skin deep. A lot of thinking and engineering have gone into this speaker. Over the phone, Canton USAs Mark Bryn, who modestly introduced himself as being "in customer support" (hes been with the company 25 years), had a lot to say about the Vento Reference 5 DC. "The purpose of the Reference line was to open the doors to using everything the engineers had learned over the years," he said. "The more exotic and high-end materials are still the province of the Vento 1, but the Vento 5 benefits from nearly all the research and technology." For instance, the tweeter is a 1" (25mm) aluminum-manganese dome with a waveguide integrated into the mounting plate. Manganese is a hard, brittle metal useful for making aluminum alloys more rigid while maintaining low mass. "This formulation results in less ringing, and is clearly a step up in performance from the titanium tweeters that Canton used previously," said Bryn. The tweeter is listed as having a frequency response up to 40kHz, but Bryn noted that the frequency-response numbers reflect a standard set by the Deutsches Institut für Normung (the German Standards Institute, or DIN): 10dB down at both the bottom and top ends. In other words, 40kHz is the frequency response of the 5 DCs tweeter at -10dB. It is designed to be flat to at least 20kHz, with a smooth rolloff beyond that. The 5 DCs overall claimed frequency response is 20Hz-40kHz (vs. 18Hz-40kHz for the Reference 1 DC), with low-frequency extension also reported at -10dB, per the DIN standard. The 7" (180mm) midrange driver and the two 8" (200mm) woofers are made of an aluminum alloy. The surround for the midrange and woofer drivers is what Canton calls a "wave" surround, which means, essentially, that it has two folds instead of the usual single fold. According to the Canton engineers, this substantially extends the drivers cone excursion, maintains linearity, and reduces distortion, breakup nodes, and cone resonances. Of particular note is Cantons Displacement Control (DC) technology, which is designed to better control the bass frequencies. "DC technology in the crossover suppresses subsonic oscillation of the bass drivers," said Bryn. "The result is more precise reproduction of bass frequencies." The crossover frequencies are 220Hz and 3kHz, and the crossover itself is made of top-quality electronic components and wired with Black Science cables. The 5 DCs impedance is nominally rated at 4 to 8 ohms, and its sensitivity at 88.5dB; overall, its an average sort of load to drive. My reference power amplifier, a Conrad-Johnson Premier 350, which is rated to put out 350Wpc into 8 ohms (or 600Wpc into 4 ohms), had no problem handling the Cantons, whose maximal input is listed as 440Wpc. "This is a pretty conservative number," noted Bryn. "It would be hard to blow up these drivers." The speaker terminals are gold-plated and suitable for biwiring or biamping. The speaker is about average size for a floorstanding tower speaker: 44.1"H x 9.8"W x 13.8"D. The 5 DC weighs a substantial 66 pounds (30kg), undoubtedly due to the cabinets 21mm-thick walls. The multiple layers of MDF are glued under heat and pressure to form a stiff, minimally resonant cabinet, and the curved side panels add to the inherent rigidity of its well-braced, multi-chambered design. The bass-reflex vent fires downward to a base plate thats open in all directions. The speaker is available in cherry or maple veneer, as well as a silver-lacquer "piano finish" that I suspect would look striking in a room with modern furniture. The review pair came with rubber pucks and metal floor spikes, and I used the spikes for all of my listening. I found the Vento Reference 5 DC easy to set up. Several weeks before their arrival, I had rearranged my listening room to move the speakers from the long wall to one of the narrow ends of my 16W x 25L room, and spent some time readjusting acoustical treatments to get things sounding right. The main improvement I heard from turning the room around was that the bass performance was now stronger and less twitchy to get right, which made the Cantons happy indeed. Canton recommends placing the 5 DCs 8" to 3 from the front wall, with a relatively modest toe-in of 0 to 5 degrees. I found they worked best in my room 3 from the front wall, 9 apart, 12 from my listening chair, and toed-in at an angle about halfway between firing straight ahead forward and directly at my listening position. Mark Bryn had an interesting take on why the 5 DC was designed for minimal toe-in. "Theyre intended to be set up in a German living room, facing straight out from the wall," he said. "None of this position them however you want setup that youd do in an American home." The other gear used in this review included an Esoteric X-03SE SACD/CD player, a Bent Audio NOH passive-transformer line stage, the Conrad-Johnson Premier 350 power amp, my reference Triangle Stratos Australe speakers ($5699/pair), Legenburg Apollo speaker cables and Hermes interconnects, ESP Essence Reference power cables, a PS Audio Power Plant Premier power regenerator, and Stillpoints isolation devices. While the Vento Reference 5 DCs were breaking in, I spent more time than Id expected to sitting back in my listening chair with eyes closed, murmuring nonspecific words of appreciation. But at last, when theyd passed the 200-hour mark and I could engage my brain and start thinking about them as well as just listening, there was plenty to talk about. The 5 DCs provided an extraordinarily complete, top-to-bottom sound. I never felt that something in the music was being overemphasized, deemphasized, or left out. They also offered a nonintrusive, nonfatiguing level of detail that I found entirely satisfying -- and gear that offers insufficient detail to satisfy my sense of realism is hard for me to listen to. Both of these qualities were abundantly evident when I played symphonic recordings. For instance, Aaron Coplands Appalachian Spring, performed by Robert Shaw and the Atlanta Symphony Orchestra (SACD, Telarc SACD-60648), is generally peaceful music, but it has some dynamic twists and turns, with quiet passages alternate with melodic lines supported by the whole orchestra. The Cantons beautifully revealed the details of individual instrumental performances while keeping everything in proper proportion. Symphonic recordings also greatly benefited from the Cantons bass reproduction. It didnt quite reach the bottom half of the lowest octave, but the clarity and volume of the bass all the way down gave a convincing level of substance and weight to the performance. The speakers were even better with jazz and pop recordings, where they really nailed the bass. During the review period, audiophile friend Jeff introduced me to one of his favorite performers, Erin McKeown, and her 2006 recording, Sing You Sinners (CD, Nettwerk 30564). Her innovative calypso interpretation of "Paper Moon" focuses on drums and rhythm, and is much fun to listen to. The Canton speakers gave the tune a sense of aliveness and bounce, and the bass was tight and tuneful -- as good as any Ive heard in my listening room. The speakers also did an excellent job of integrating the outputs of the bass and midrange drivers -- not always easy to do. The Cantons level of integration was really brought home when I played Patricia Barbers Nightclub (CD, Premonition/Blue Note 27290). I listened to this recording extensively two years ago while deciding to buy my current reference speakers, the Triangle Stratos Australes. In particular, "Blackbird" is filed in a deep groove in my brain, and has essentially defined for me the way I hear the Triangles. But the Vento Reference 5 DCs gave Barbers performance a new level of coherence and detail, allowing me to hear it more as a "you are there" experience, with a more realistic soundstage and level of presence. A couple of minor quibbles: The Cantons high frequencies werent quite as extended as those of the best Ive heard, the Reference 3A Grand Veena ($7995/pair). By comparison, the 5 DCs highs were wanting just a bit of air and high-end realism. But within their range of performance, the Cantons highs were remarkably clean and undistorted, even when challenged by the high harmonics of trumpets and violins. In addition, there was a slight hardness to acoustic timbres compared with my reference Triangle loudspeakers, but it was never intrusive, even during extended listening. Overall, the Vento Reference 5 DC was both faithful to the music and easy to listen to. Its sometimes hard to quantify what makes a loudspeaker "worth it" when youre looking at a five-figure price tag. But theres no conversation going on in me about whether or not the Canton Vento Reference 5 DC is a good value. It simply and obviously is. I have seldom heard any speaker give such a complete and satisfying presentation of the music from top to bottom, without gaps, weaknesses, or compromises. There were minor areas where I can imagine improvement, but none that subtracted from my sheer enjoyment of the music. Canton has decades of experience in making loudspeakers, and has taken their business seriously by investing in the development of new technology. Auditioning the Vento Reference 5 DC should be something like test-driving a BMW: You neednt worry about quality or even performance compared to other speakers in its price range, only whether or not the style of it suits you. So Im delighted to designate the Canton Vento Reference 5 DC an Ultra Audio Select Component. Few of the audio components that have come through my listening room have given me as much pleasure. There are many words to describe the 5 DC, but ultimately, its not about words. The musical food this speaker serves up is just delicious -- sit back and enjoy.